In a continuing effort to close out 2015, allow me to take a slightly different approach to year-end lists. As 2014 for me was much about researching and writing a book and 2015 was promoting and selling it, it seems fitting to share with you some of my most interesting and best experiences along the way to finalizing my Beer Lover's Mid-Atlantic book. This is a two-part series. Last week, I focused on some of the special brewing establishments that I found on the road to great beer. Today, I look back on some of the memorable bars and restaurants encountered along the way. This was not an easy list to put together. So many places are doing such good things to showcase great beer. Their inclusion alone in a book with limited space should speak volumes about how I feel about each of them. Here are some ways that some of them stood out to me. Longest Drive — Roff School Tavern, a mere 370 miles from home in Meadville, Pa. which is also where you'll find the excellent Voodoo Brewing Company. Closest to home — Flying Pig, less than two miles from home, is everything a neighborhood corner bar should be. Epitome of Neighborhood Joint — This is a tough one because if you're a bar doing it really well, you're probably doing a very good job at catering to a neighborhood...a community of regulars. And while that's true for nearly every bar/restaurant in the book, there are a few that stood out in my memory just that little bit extra. Delaware — Washington Street Ale House serves a cross-section of professionals, students, sports fans, and families that find the bar to be a comfortable meeting place. Maryland — Mahaffey's in Baltimore's Canton neighborhood celebrates its regulars each Sunday and nearby Annabel Lee Tavern is the perfect hideaway where the Poe theme further underscores the neighborhood watering hole. Over in Ellicott City, The Judge's Bench is welcoming even while feeling like an insider's club. New Jersey — Andy's in Bogota and Cork City in Hoboken each have that feeling where time and care slip away easily when hunkered down at the bar. Pennsylvania — With the Flying Pig mention out of the way above, suburban Philly's Station Taproom and TJ's and entrenched city bars McMenamin's (Mt. Airy) and the P.O.P.E. (Passyunk Square) have staffs that know your name if you're even a part-time regular. Youngest bar — Smaltimore was not on my original hit list of bars but was recommended to me by a bartender at The Owl Bar. No wonder, it had opened less than a year earlier in July 2013. In addition to plenty of futbol and other sports on television, they've got that stock market-like supply-and-demand pricing thing going on there. Oldest bar — Depending upon how you look at things, Jessop's building in New Castle, Del. has been around since 1674, Jean Bonnet Tavern in Bedford, Pa. likewise since 1762, but McGillin's in Philly has been operating continuously (well, maybe, not really, but maybe?) since 1860. 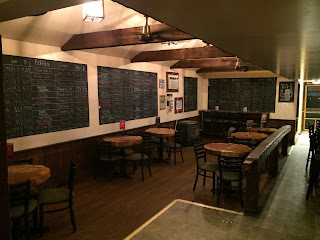 Most supportive/enthusiastic — Either hosting me for multiple events or stocking my book at the bar or their retail shop, the following have shown tremendous support for which I'll never forget: Devil's Den/Barren Hill, Eulogy/Bierstube, Grey Lodge/Hop Angel Brauhaus, Capone's, Home Sweet Homebrew, and Keystone Homebrew Supply. Favorite glassware — I either cannot recall bar-specific glassware during my travels or it's not really something worth dwelling on here. What is worth pointing out with regard to glassware, however, is Teresa Next Door's fastidious hand-drying of every piece of glassware which they've done since day one. On an unrelated note, Andy's Corner Bar in Bogota, NJ serves each beer in a piece of glassware outfitted with a pretzel on a stick. Nod from the college kids — I heard from numerous Penn State grads that endorsed my selection of Zeno's in State College, Pa. and The Knickerbocker in Altoona, Pa. as solid beer bar choices. Pitt alumni cheered their foggy memories of Mad Mex's beers and Big Azz Margaritas. 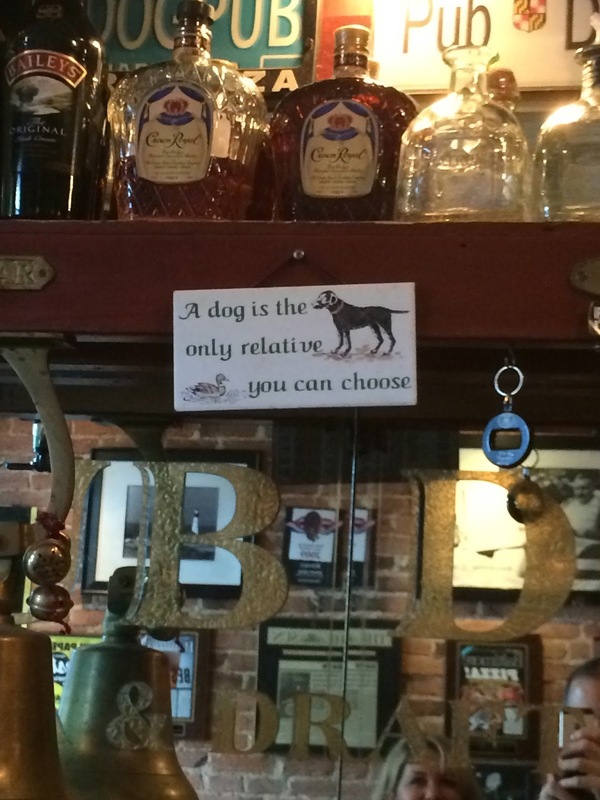 And, University of Delaware students vouched for Home Grown Cafe beers, bloody mary's, and brunches. Up a creek — Sharp Edge in Pittsburgh has its Creekside location. On the east side of Pennsylvania, the rural location of Union Jack's near Boyertown, Pa. has indoor comfort and live outdoor creekside music to accompany the stellar lineup of beers and food. Movin' and Groovin' — I have a small section in the book focused on finding beer when traveling. While the area airports have some pretty decent beer options, you still need to get through TSA and/or some other type of hassle (parking, etc.) to get there. That's where Bridgewater's at 30th Street Station comes in. Open to the public. 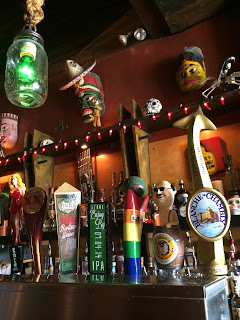 Serving a constantly rotating selection of great local beer and beer from around the world. Plus, what other train station can you find wild boar, prosciutto, mussels, baba ganoush, alligator, and a tofu banh mi? 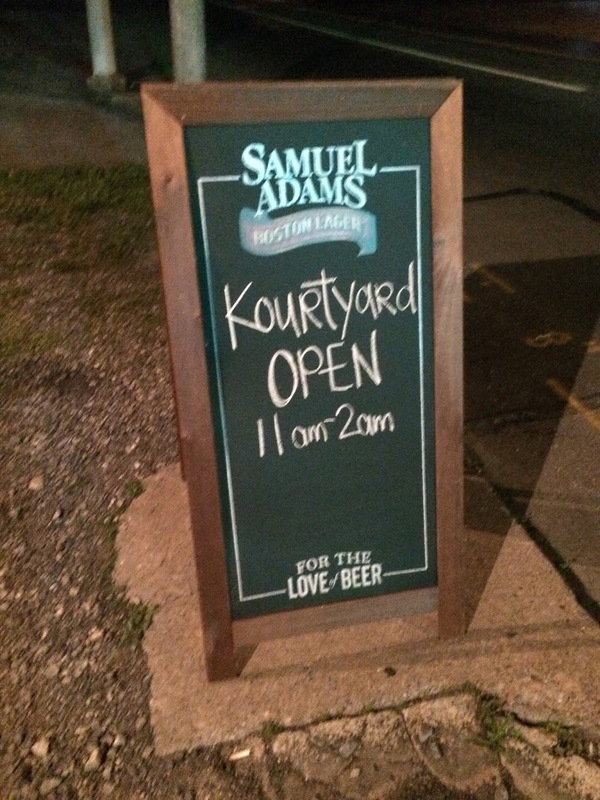 Plus, grab a beer to go and catch your train just minutes later. Case closed. 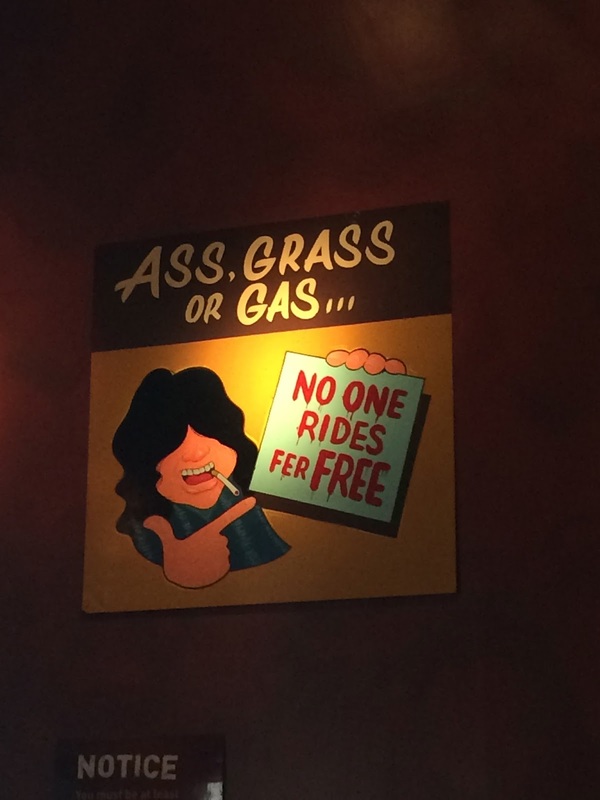 Best bar sign — I'm sure I've got plenty more, but here are a few that I could readily place. Best pizza — Okay, this is embarrassing. I had quite a bit of very good pizza in my travels. Not sure anything touches Sabatini's special family recipe in Exeter, outside of Scranton, Pa. Yet, I can't find the pictures. I know; given my obsession for organization, this is shocking. Best Szechuan Chinese — It wouldn't be fair to point out that Han Dynasty is the only one in this category because what they do in the kitchen is extremely good. But, their two locations that serve alcohol also do beer very good. Best burger — When I can't get to Matawan, NJ for Maloney's Burger, I'm sticking to my local turf for a burger from Monk's Cafe in Philly or TJ's in Paoli. 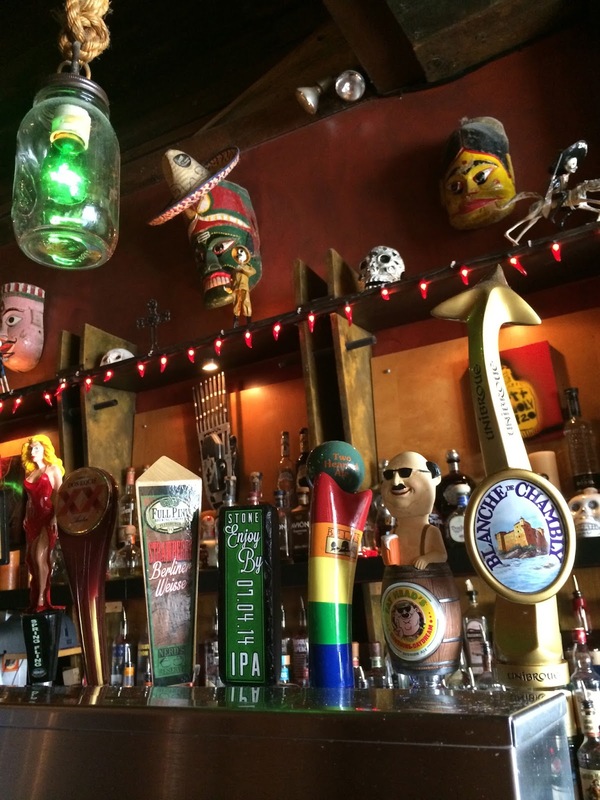 Best locals-only — Many bars are discovering the benefits of sticking to their local big guns. Standard Tap and Johnny Brenda's in Philly discovered it longer ago than most. Best Irish — I think every bar has a good dose of Irish in it somewhere. Fergie's in Philly just has enough more to put it at the top of the list. 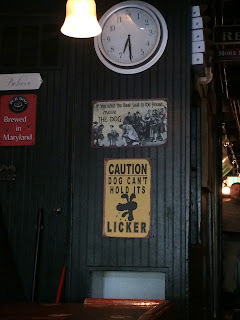 Best German — I wasn't surprised by what I found at Brauhaus Schmitz, Hop Angel, or Bierstube in Philly. Schmankerl Stube surprisingly impressed in Hagerstown, Md. Best English Pub — Perfect Bulls Head Public House in charming Lititz, Pa.
Best bartenders — I'm chickening out and not going to touch this one. Best food program coinciding with great beer — There are great kitchens that happen to have great beers pouring at the bar. There are great beer bars that happen to have some pretty good food coming out the kitchen. Then there are those that are immediately obvious that they make a conscious effort to promote the food, the beer, and the intersection of the two. For their beer dinners and events and attention to detail, Victoria Gastropub in Columbia, Md. and Morris Tap & Grill in Randolph, NJ rise to the top. Best tour — This is a bit of a cheat. Mohawk House in Sparta, NJ doesn't really offer tours. I received one from top to bottom of each of the numerous bar and restaurant rooms as well as beneath the massive building and in the well-organized cold box. The exterior grounds are as impressive as the interior. 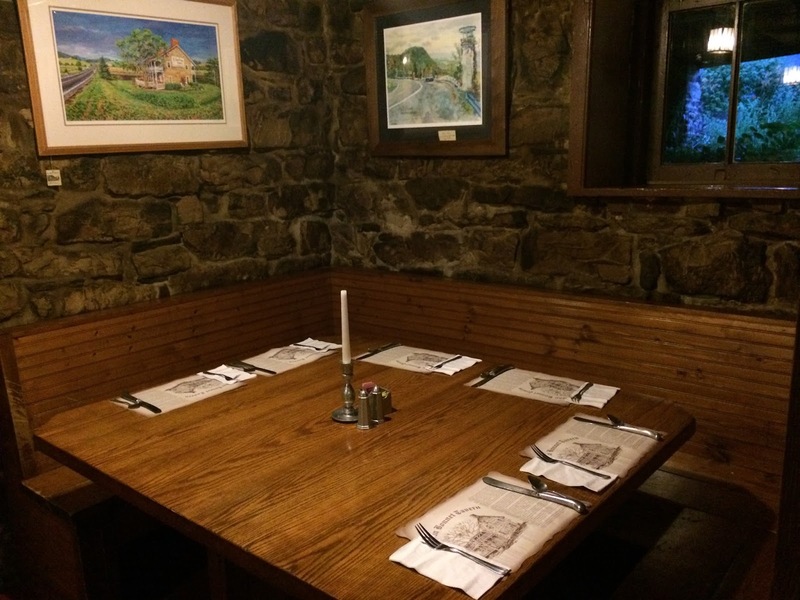 Best ghosts — When at Jean Bonnet Tavern's bar, ask to see the documented proof that when you're eating, drinking, or sleeping at the tavern/inn, you're not alone. Highest/lowest altitude — Jean Bonnet Tavern has made numerous appearances in this post. This time it's for its location in Bedford, Pa., at 1180 feet, just a few steps higher than Zeno's in State College (1151 feet), and The Knickerbocker in Altoona, Pa. at 1125 feet. Predictably, in Atlantic City, NJ, The Irish Pub rises just 16 feet above sea level. Most Comfortable — I came across plenty of comfortable drinking environments in my travels for this book. None kept me longer than The Knickerbocker and its "Kourtyard" in Altoona, Pa.
Best bar within a homebrew shop — Not technically "in" the homebrew shop, but you can grab a beer and walk between the Copper Kettle Brewing Company you-brew homebrew shop and Hough's in Pittsburgh's Greenfield neighborhood. Best bar within a bottle shop/retail store — Follow the signs through to the rear of the massive retail shop in Beltsville, Md. and you'll find Old Line Bistro. Your excuse can be, "I wasn't at the bar, I was shopping!" Best bar calling itself a brew pub that is really not a brew pub — Still confusing after all these years, they should just drop the "brew pub". Nonetheless, the beer, food, and sports are spot on at Goodnight Irene's in Wildwood, NJ. Best historical property — New Castle and Odessa, Del. are teeming with history and Cantwell's and Jessop's, respectively, contribute to the scenery quite well. Best urban — The Owl Bar is Baltimore's tucked away speakeasy of sorts inside a former hotel in the city's Mt. Vernon neighborhood. Across town in Fells Point is another cozy urban oasis — Wharf Rat. Best non-urban property — In Stanhope, NJ, the Salt Gastropub is a perfect refueling spot after hiking, biking, fishing, and boating in Allamuchy Mountain Park. Best dive bar — Dive bars were very important to me for inclusion in this book. Fiume in Philly is excellent. So is Quarry House Tavern in Silver Spring, Md., Shady McGrady's in Harrisburg, Pa., and Arena's in Rehoboth Beach. 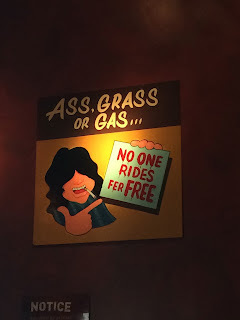 Gooski's, however, rises to the top as Pittsburgh's "...perfect escape from whatever, or whomever..."
Best pretty bar — Mohawk House in Sparta, NJ spent millions to build the mecca to great food and beverage and it shows. Best strip mall space — Just another strip mall space? Not so at Ulysses Gastropub just outside of Wilmington, Del.-proper. Batting average pretty good, eh? — None of the bars and restaurants in the book have yet closed. While I can feel badly that some places did not make the book for lack of space, this stat has me feeling rather satisfied for the time being. Return from ashes — Like the brewery wrap-up I did last week, fire touched one of the bars in the Maryland chapter as well. Quarry House Tavern sits under an Indian restaurant just outside the DC border in Silver Spring, Md. A fire in the upstairs restaurant caused significant smoke and water damage to the subterranean bar. They've temporarily relocated across the street to keep things going in the interim. According to their social media, they are on track to re-open in the original space in the first quarter if all continues to go well.